Head and neck squamous cell carcinomas (HNSCC) have been causally associated with tobacco and alcohol exposure. However, 10–15% of HNSCC develop in absence of significant carcinogen exposure. Several lines of evidence suggest that the genetic composition of HNSCC varies based on the extent of tobacco/alcohol exposure, however, no genome wide measures have been applied to address this issue. We used comparative genomic hybridization (CGH) to screen for the genetic aberrations in 71 patients with head and neck squamous cell carcinoma and stratified the findings by the status of tobacco/alcohol exposure. Although the median number of abnormalities (9), gains (6) and losses (2) per case and the overall pattern of abnormalities did not vary significantly by the extent of tobacco/alcohol exposure, individual abnormalities segregating these patients were identified. Gain of 1p (p = 0.03) and 3q amplification (p = 0.05) was significantly more common in patients with a history of tobacco/alcohol exposure. This data suggests that the overall accumulated chromosomal aberrations in head and neck squamous cell carcinoma are not significantly influenced by the severity of tobacco/alcohol exposure with limited exceptions. A causal association between squamous cell carcinoma arising in the head and neck region (HNSCC) and exposure to tobacco and alcohol is well established [1–3]. However, 10–15% HNSCC occur in patients without any antecedent history of tobacco or alcohol exposure [4, 5]. Several studies have suggested that these patients have a divergent clinical course compared to patients with tobacco associated HNSCC, which may be a reflection of differences in the genetic composition [4–6]. Empiric evidence suggesting that non-smokers may respond differently to carcinogenic insults is offered in a report by Schantz et al., showing the highest levels of chromosomal sensitivity in lymphocytes after exposure to the clastogen bleomycin in HNSCC patients who were non-smokers . Relatively few studies have directly investigated the impact of tobacco/alcohol exposure on the genetic composition of HNSCC. Amplification and expression of cyclin D1, p53 mutation and deletions of 3p, 5q, and 9p21 are suggested to be influenced by the degree of tobacco exposure [4, 6, 8]. The largest effort on this topic has been reported by Koch and colleagues, who found significantly higher rates of p53 mutation and loss of heterozygosity at 3p, 4q, and 11q as part of allelotyping analysis of 10 individual loci . No studies have utilized true genome-wide evaluative measures to analyze the impact of carcinogen exposure on the accumulated chromosomal abnormalities in HNSCC. Comparative genomic hybridization (CGH), originally described by Kallionemi in 1992, is an ideal screening measure, allowing the simultaneous detection of gains, losses and amplifications in genetic information in an individual tumor . In addition, several authors have used the total number of chromosomal abnormalities as an assessment of genomic instability . In this study, CGH analysis showed the presence of significant overlap in genomic instability and in the individual chromosomal abnormalities based on the degree of tobacco/alcohol exposure in HNSCC, with the exception of gains/amplifications at 3q and 1p. The study population was divided into 15 (21%) patients with limited and 56 patients (79%) with a significant tobacco/alcohol exposure history. Of the 15 patients in low-level tobacco/alcohol exposure group, 13 patients gave no history of tobacco usage, while 10 patients gave no history of alcohol exposure. Of the two patients with tobacco exposure histories, one gave a history of smoking less than 2 packs of cigarettes in her lifetime and the other had a history of smoking 0.5 pack years, 51 years prior to presentation with cancer. Although patients without significant tobacco/alcohol exposure were younger in age, there was no significant difference in all other clinical, tumor, treatment and outcome characteristics (Table 1). The difference in age based on the severity of tobacco/alcohol exposure has been previously described [4, 7]. Differences in clinical, pathological, and CGH findings by status of carcinogen exposure. 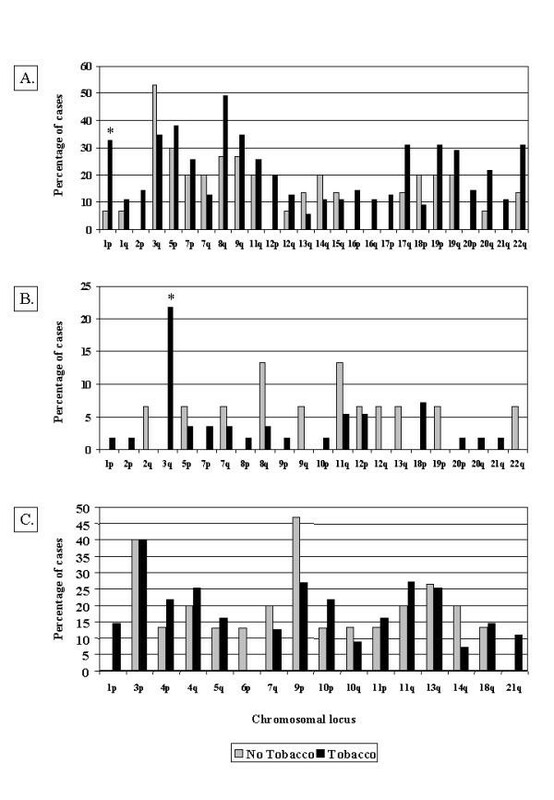 The median number of copy number abnormalities was 9 per case, ranging from 0 to 27. The most common sites for gains were 1p, 3q, 5p, 6p, and 11q, losses 3p, 4q, and 13q, and amplifications 3q25-27, 11q13 and 8q24-qter (Figure 1). These results are congruent with those reported in the literature for CGH analysis of HNSCC [11–14]. The level of genomic instability, measured by the median number of continuous copy number changes by CGH analysis was also not influenced by the severity of carcinogen exposure. These findings are in contrast to allelotyping studies, which show higher rates of abnormalities in patients with significant tobacco/alcohol exposure . Since tobacco is known to cause single strand breaks, it may be aberrant repair of these changes that is detected by LOH, which are below the threshold of detection by CGH. 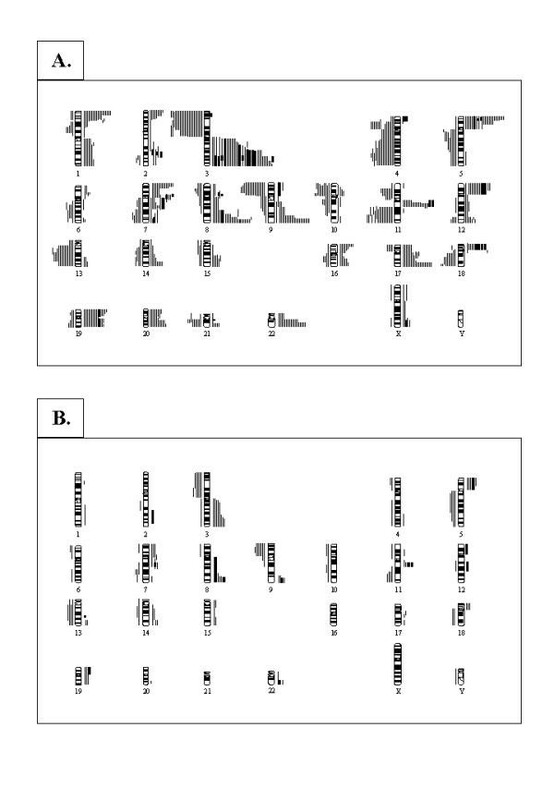 Ideogram showing DNA copy number changes identified by CGH analysis of primary tumors derived from patients with head and neck cancer with (A) and without (B) tobacco/alcohol exposure. Caption: Thin vertical lines on either side of the ideogram indicate losses (left) and gains (right) of the chromosomal region. The chromosomal regions of the high-level amplification are shown by thick lines (right). Although the total number and general pattern of abnormalities were similar, the prevalence of individual abnormalities was different based on the extent of tobacco/alcohol exposure as outlined in Figure 2. Amplification at 3q26-27 (p = 0.05) and gain of 1p (p = 0.03) were significantly more common in patients with carcinogen exposure. A high prevalence of 3q amplification has been reported in many studies on tobacco-associated cancers, including those of the lung, cervix and esophagus [11, 13, 14, 15, 16, 17]. We and others have shown that PIK3CA is a candidate oncogene at 3q in these tumors [12, 18, 19]. Interestingly, PI3K pathway has been suggested to play a role in modulating the effects of benzopyrene, a tobacco-derived carcinogen, and its metabolite, anti-7,8-dihydroxy-9,10-epoxy-7,8,9,10-terahydrobenzopyrene . Although less frequent, 1p gains are also common to many tobacco-associated malignancies [11, 13, 14, 15, 16]. Work by Racz and colleagues suggest that PAX7 and ENO1 may be candidate oncogenes in this region . PAX7 is part of a family of transcription factors known to be carcinogenic. Evidence suggests that gain of function in PAX7 triggers neoplastic development by maintaining cells in a deregulated, undifferentiated and proliferative state, as is seen in alveolar rhabdomyosarcomas. Loss of 6p was an event unique to patients with no tobacco/alcohol exposure. This site may contain a factor protecting cells from tobacco induced carcinogenesis, including genes such as MSH1, a gene involved in mismatch repair . Several limitations must be taken into account when assessing this work. First, the retrospective nature of the data collection introduces inherent biases. Second, although it is amongst the largest studies analyzing of genetic differences based on carcinogen exposure, the sample size remains small limiting statistical power to detect existing differences. Finally, CGH is limited in resolution to copy number abnormalities >5 Kb, making it likely that smaller aberrations may exist that are influenced by tobacco/alcohol exposure. Taking the limitations into account, we identified no differences in the degree of chromosomal instability and significant overlap in the pattern of chromosomal aberrations occurring in patients with HNSCC divided by the severity of tobacco/alcohol exposure. However, several individual differences exist, including amplification of 3q and gain of 1p, which may represent specific sites of damage by tobacco/alcohol carcinogens. Further work is required to refine the finding of this study and understand its implications. Tumor samples from patients undergoing curative treatment for HNSCC were obtained at time of biopsy or surgical resection in the operating room, following guidelines established by the Institutional Review Board. Only patients with previously untreated HNSCC were included in this study. All samples were analyzed histologically to confirm the presence of >70% carcinoma. The study population included 71 patients ranging in age from 38 to 89 years (median- 61 years). There was a predominance of males (66%). The oral cavity (17%) and laryngopharynx (83%) were the most common primary sites. Overall, 36 (51%) patients were treated surgically, with adjuvant radiation utilized for patients with advanced TNM stage (4 cases) or extracapsular extension pathologically identified in nodal metastasis (2 patients). Radiation alone was utilized in 35 patients and in combination with chemotherapy in 33 patients. The median follow-up for the study population was 38 months, ranging from 2–109 months. Tobacco usage was assessed in pack-years, defined by the number of packs of cigarettes smoked daily multiplied by the number of years of active smoking. For the purposes of this analysis, smoking 4 hand rolled cigarettes, 4 cigars, or 4 pipes full of tobacco was considered equivalent to smoking 1 pack of industrial cigarettes. Tobacco usage was coded as a dichotomous variable, and was considered positive if a greater than 2-pack year smoking history was reported. Alcohol consumption was also recorded as a dichotomous variable, and was considered positive when daily usage of two alcohol equivalents on a daily basis or binge alcohol usage (repetitive use of >5 alcohol equivalents at a single sitting) was reported. For the purpose of this study, patients were divided into two groups based on the history of carcinogen exposure. Group 1 had a limited or no history of tobacco and/or alcohol exposure, while group 2 patients reported significant tobacco and/or alcohol exposure. Outcome of treatment was evaluated on the date of last patient contact by determining the presence or absence of cancer and the vital status (alive, dead, or unknown). The date and location of the first recurrence was ascertained. For patients who died, the cause of death was determined from review of the death certificate, physicians' death summary, and/or tumor registry records. Disease-free survival was determined as the differences between time zero (date of first treatment) and the date of first recurrence. Cause-specific survival was the difference between time zero and the date of death due to cancer. CGH was performed using previously published methods . Seven to 10 separate metaphases were captured and processed using the Quantitative Image Processing System (Quips Pathvysion system, Applied Imaging, Santa Clara, CA). Red, green, and blue fluorescence intensities were analyzed for all metaphase spreads, normalized to a standard length, and statistically combined to show the red: green signal ratio and 95% confidence intervals for the entire chromosome. Copy number changes were detected based on the variance of the red: green ratio profile from the standard of 1. Ratio values of 1.2 and 2.0 were defined as thresholds for gains and amplifications, respectively, and losses were defined as ratio of 0.8 or lower. Statistical comparisons were performed using the JPM software (SAS Institute, Inc., Cary, NC). Descriptive statistics were used to summarize study data. Statistical significance was accepted at a two-tailed p value of less than or equal to 0.05. The p-value for accepting significance was not adjusted for multiple comparisons. Non-parametric qualitative and quantitative comparisons were performed using Fisher's exact test and Kruskal-Wallis analysis of variance, respectively. The Chi square test was utilized for multi-group, qualitative comparisons. Survival data was censored for patients lost to follow-up, surviving to the end to the study, or dying of causes unrelated to cancer. Survival curves were generated using the Kaplan-Meier (product-limit) method to allow maximum use of censored observations. Survival comparisons were performed using the log-rank test. B.S. and V.B.W contributed equally towards the completion of this work. Supported in part by the Young Investigator Award from the American Society of Clinical Oncology (BS), the Byrne Fund (BS), Hayes Family Fund (DP) and the Faculty Research Fellowship from the American College of Surgeons (BS). The authors would like to acknowledge the invaluable guidance and contributions of Dr. R.S.K. Chaganti, Ph.D. and outstanding editorial assistance from Ms. Nancy Bennett. BS was involved in the conception, planning, organization and supervision of the project. He performed comparative genomic hybridization experiments. VBW contributed equally to the completion of all experiments. DP, ARS, DK and JPS assisted to conception, planning and manuscript preparation. AP assisted with clinical data collection and statistical analysis. PHR assisted with comparative genomic hybridization analysis and confirmed all cytogenetic assignments and was the co-supervisor in the project.